Hey guys! I'm back with another Winter release. The complete KBShimmer 2014 Winter Collection includes 11 new polishes and five re-releases, in addition to four new cuticle oils and holiday-themed nail vinyls. In this post, I'll be showing you swatches of 10 of the 11 new shades (GAH! I just went to post and realized I forgot one!) KBShimmer always impresses me. I love everything Christy does and she is such a class act. So let's get started. Turnip the Beet is my favorite. Wow. It's a rich berry shade with magenta, purple and red holo glitters. The result is a textured, sparkly explosion. My ring finger has one coat of KBShimmer Clearly on Top topcoat...so you can see it shiny...which is also awesome! 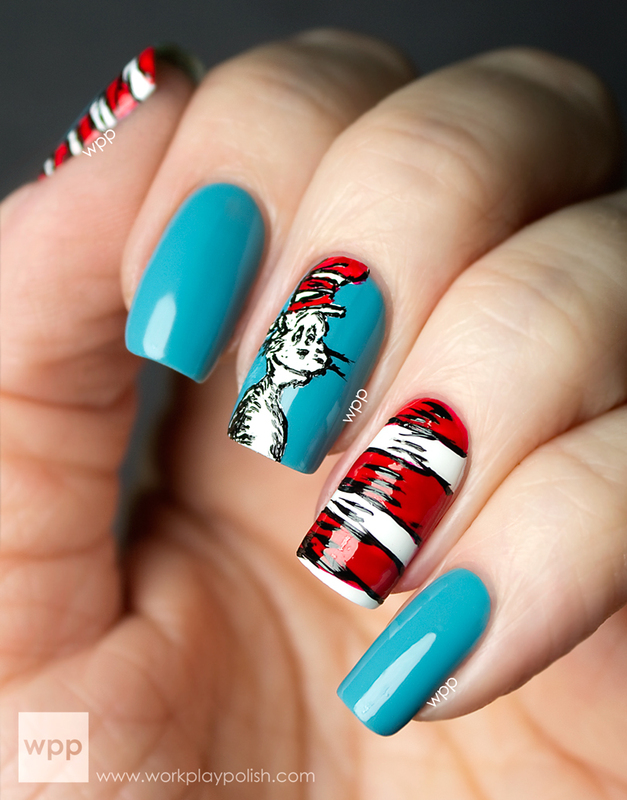 The formula is on the thick side, but it applied easily and covered in two coats. 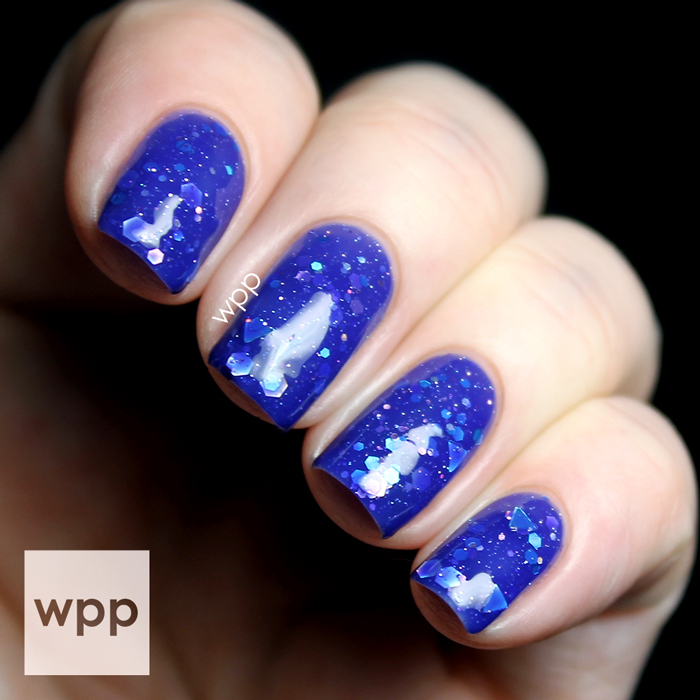 Fallen Angle is a bright blue jelly with holo blue triangles, silver and blue hexes, and sparkly micro glitters. The blue color is really vibrant and the triangles are a neat addition. It applied easily, even with all that glitter. I ended up using three coats, but you could easily stop at two. 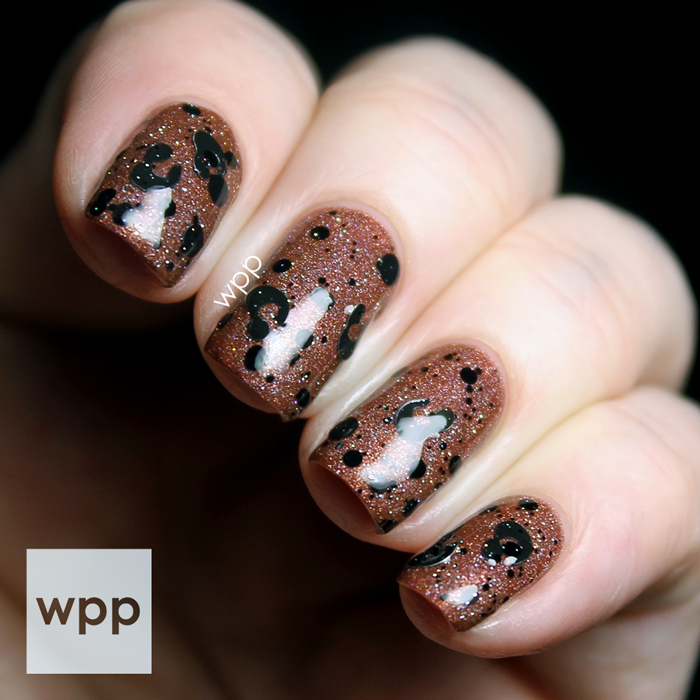 Deja Brew is a coffee-inspired, cinnamon brown holo. The effect is warm and perfect for autumn and winter. I didn't expect to like this one so much. It's another favorite. The formula is really smooth and complete in two coats. Dressed to Gild is a crazy beautiful gold holo textured polish. Super blingy! With all the sparkle going on, it's hard to tell, but I used topcoat on my ringer. I love it both with and without. This polish is super dense. This is two coats. 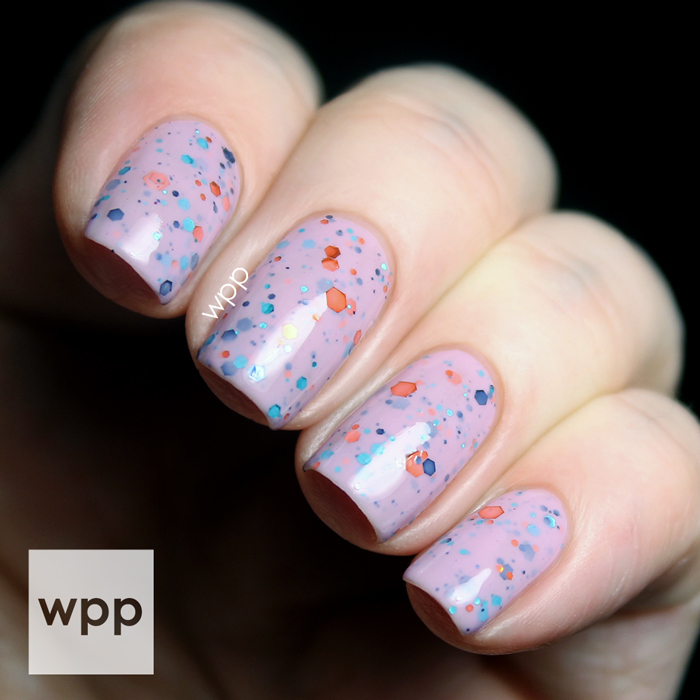 Mauve Over You has orange, blue and teal glitters in a creamy lavender base. When I read the description, I thought this was a strange combo. But the result is pretty. I used three thin coats for complete coverage. Too Cold To Hold is another textured polish. The medium blue base is filled with holo silver and blue glitters. Like the others, the formula was dense, but easy to apply. My ring finger has one coat of topcoat. Gorgeous. Next is Let's Sleigh Together. I love the pale gray crelly base filled with glitters in blues and greens. 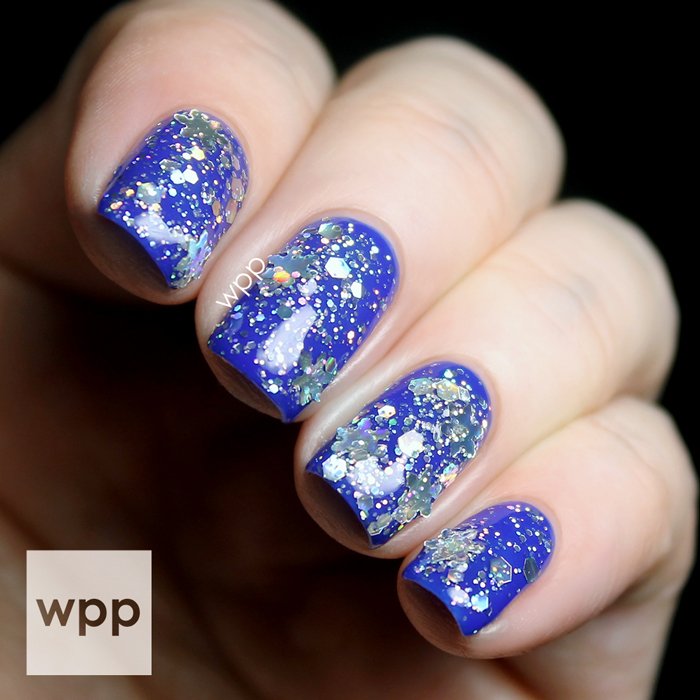 This is a great casual outfit polish, just as KBShimmer describes. I used three thin coats. Flake Dance is a beautiful holo silver snowflake-filled topcoat. I used one coat over one of my fave ever KBShimmers, Low and Be Bold. KBShimmer recommends swatching this over a cream colored base. Spot Sign is a super cool glitter topper. The clear base has leopard spot-shaped, black glitters along with black circles and micro glitters. Genius! This took some care to apply. I went over the nail once with a stiffer swipe to coat it with the smaller glitters. Then I placed the leopard spot glitters individually. I found if I tried to lay it all down at once, the glitters bunched up. But I still love it. I've swatched it over Deja Brew. 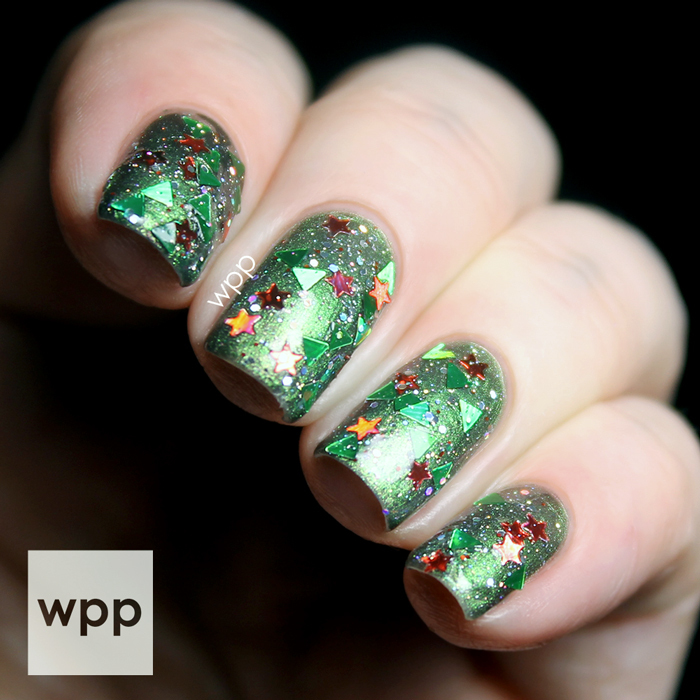 And last, but not least, is Pine-ing For Yule, the 2014 Toys For Tots ® charity polish. This holiday themed glitter top coat includes holo green triangle “Christmas Trees” and red star tree toppers in a clear base. I've used one coat over KBShimmer Urban Camo. For each bottle sold at KBShimmer.com from 11/01 until 12/25 $4 will be donated to Tots For Tots, so jump on this one! The polish I forgot is White Here, White Now. It's a snowy white, textured polish. 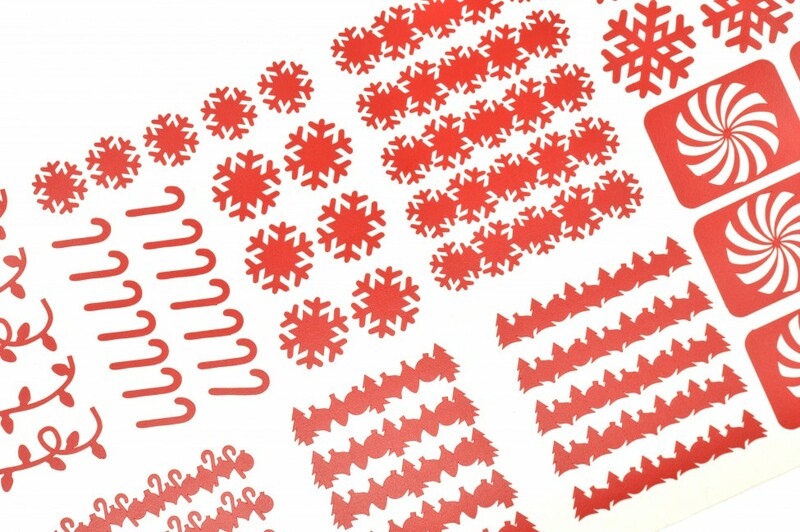 In addition to all this great polish, KBShimmer has also released a set of holiday-themed nail vinyls (kbshimmer image below) and some new cuticle oil pen scents. How fun! This collection is a home run. Especially the pink, gold and blue textured polishes. 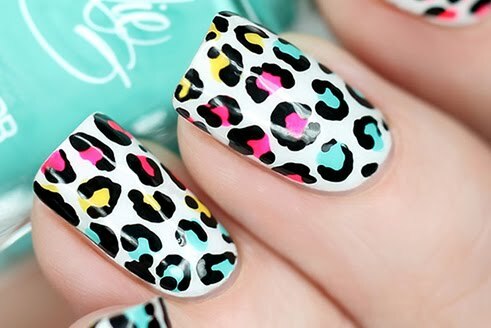 Love those! The KBShimmer Winter 2014 Collection is available now on kbshimmer.com and harlowandco.org. Each polish is $8.75 and vinyl sheets are $5.00. Christy is also offering a few great deals, like free samples with each order while supplies last. Follow KBShimmer on facebook, instagram and twitter for news and promotions.